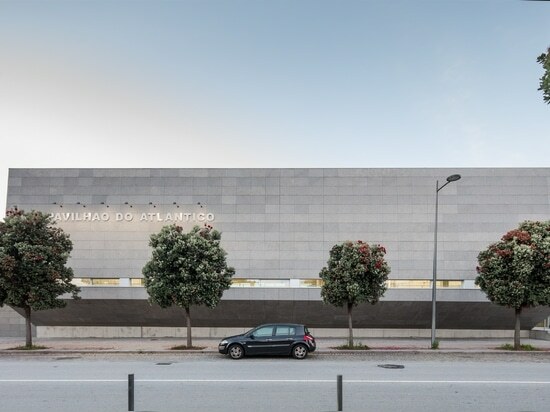 The building is situated next to “Avenida do Atlântico” in Viana do Castelo. 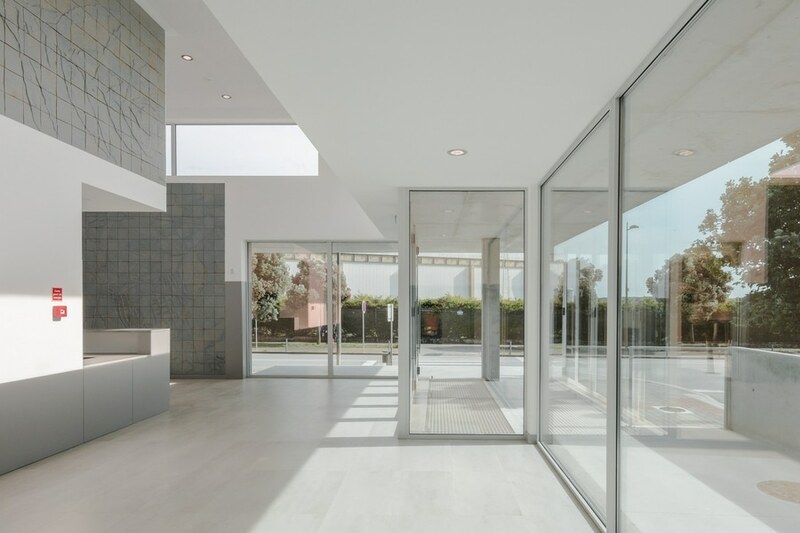 An avenue facing the sea, in which a series of buildings are constructed, which, on a first impression, the urban front, in which the building is inserted, transmits a rather insipid image due to the nature of the programs and options taken in its projects. 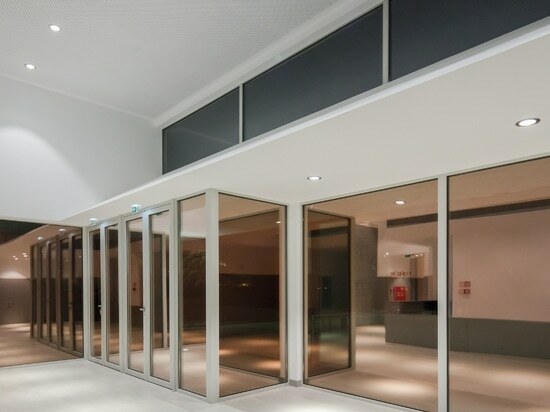 A characteristic which has become an asset in the conceptualization of the project of the Atlantic Pavilion. 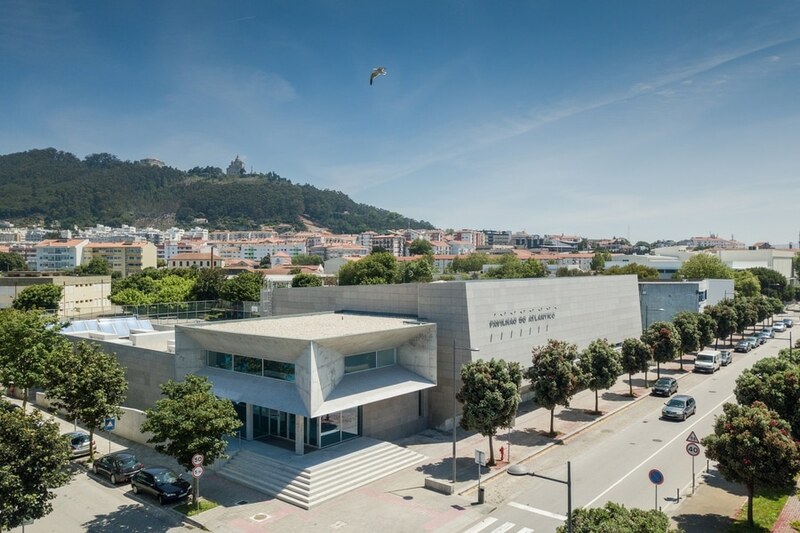 Besides the necessity of the City Council of Viana do Castelo having a sports pavilion, it gives support to the EB 2,3 Pedro Barbosa School and for complementarity use by the community to develop various modalities, it is mainly adjacent in the county’s objectives, to expand the population’s possibility of practising sports activities in covered facilities. 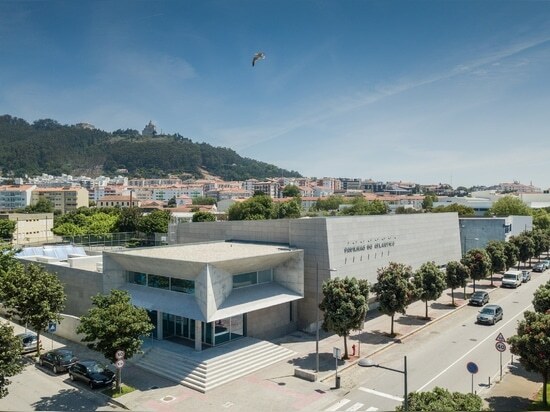 Due to the necessity of a strong financial control and endow the thought of building infrastructures for a future easy access maintenance, the global cost of the work was restricted in a pre-established value by the City Council of Viana do Castelo. Demands which became a true challenge in the way of thinking to respond to what was requested. 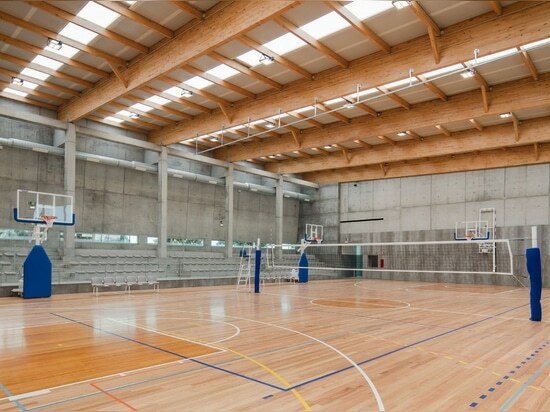 Hence, the use of the brutalist image in the project without being taken to extremes, perceptible in the change rooms and sports field. 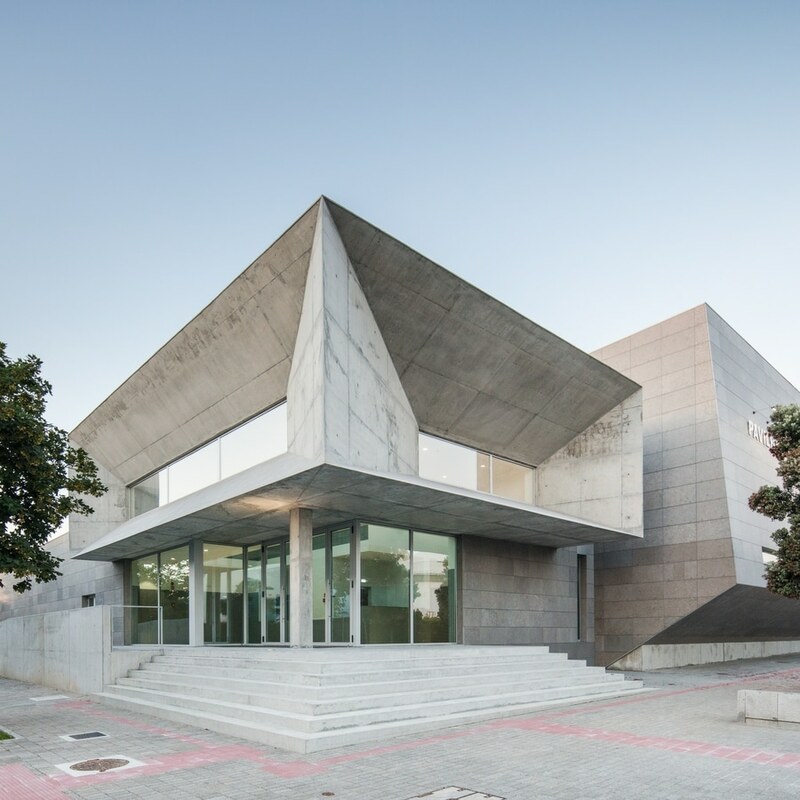 It was with this intention that Valdemar Coutinho Architects devised a Pavilion, reflecting the various program and budget demands with an appealing dynamic and humanized image, minimizing the common impact in these types of buildings. Due to the limited land, the project occupies practically the whole area. 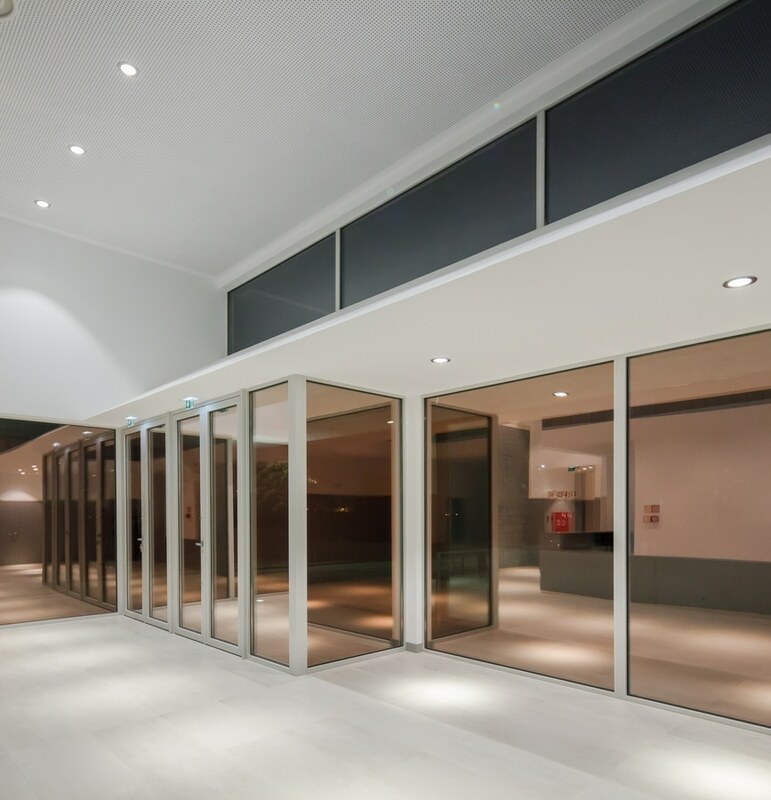 The dimension of the programme was developed on a floor at a ground floor level with a secondary storage area. 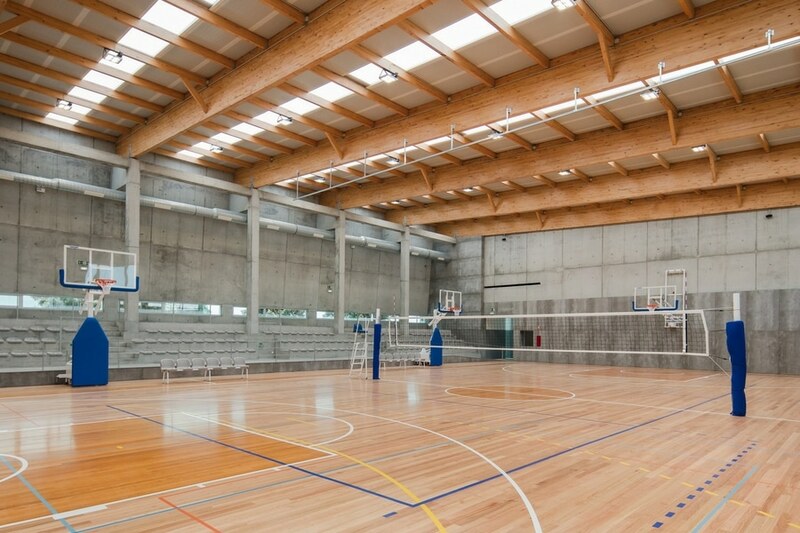 The surface for sports practise is 650 m2 (to play volleyball and basketball essentially) with a height of 7.50m, with 4 independent blocks of change rooms, 2 blocks for the athletes, each one with a capacity for 15 to 20 sportsmen and another 2 for coaches and referees. In the union of the two bodies, the main entrance is developed, where 50/80 people can wait until they find seats. 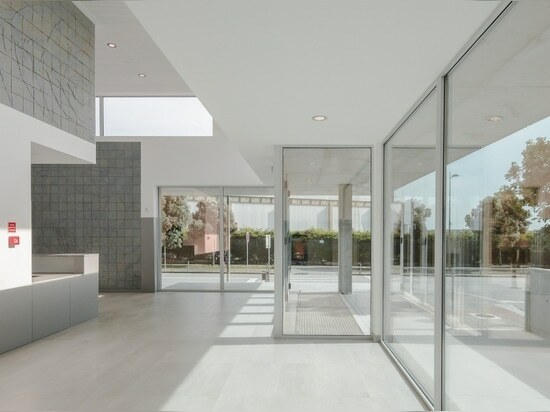 In this jockey ball around the entrance, a reception, a surveillance post, a cafeteria which operates punctually according to the necessity, a technical support area, sanitary facilities for males and females as well as for those with reduced mobility. Volumetrically, the pavilion, in general terms, is made up 2 parallele piped bodies (East and West body) perpendicularly implanted between themselves, forming in their whole a unique volume of dynamic and restrained lines. 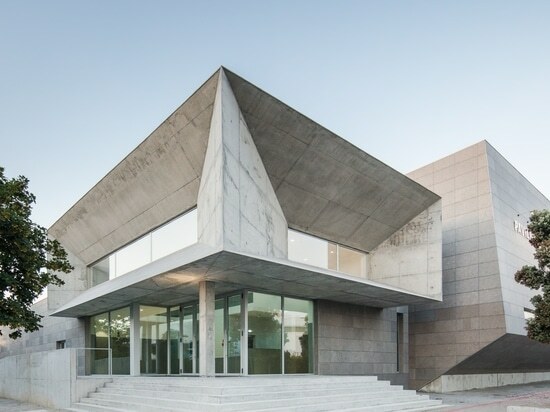 The building predominantly presents two finishing materials, the apparent concrete and grey-bluish stapled stone tack. 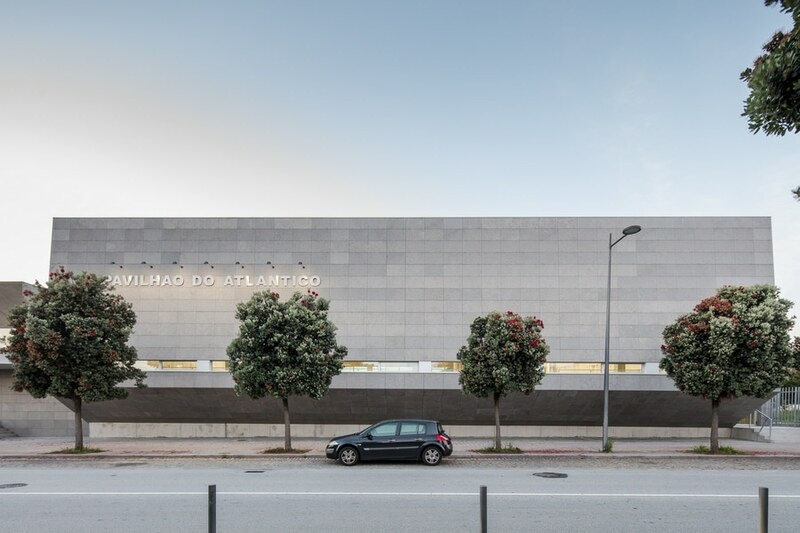 The general tone of the building is grey, which reminds us of the beautiful grey sea, in the same way the entrance hall has various panels of grey embossed tiles, allusive to the crustaceans and the algae of the Viana do Castelo beaches, executed by the plastic artist Mário Rocha.